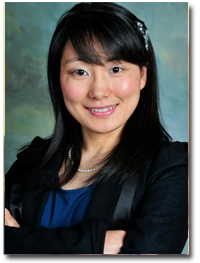 Haiyan Wu has a master’s degree in oriental medicine and a bachelor’s degree in medical science. She has been practicing in Traditional Chinese Medicine since 2004. She is a registered acupuncturist in Michigan and California. She is certified by the National Certification Commission for Acupuncture and Oriental medicine (NCCAOM). When Haiyan was young, she learned Chinese medicine from her mother, a well known Chinese medical doctor who has now been practicing over 40 years. She studied at Heilongjiang University of Chinese Medicine which is one of the top Chinese Medicine schools in China with a bachelor’s of medicine. In Heilongjiang University of Chinese Medicine, she established a solid knowledge of both eastern and western medicine. In addition, she had extensive training in the hospital which is affiliated with her medical school, Harbin Chinese Medical Hospital, and Harbin Railway Bureau Hospital. She also holds a master’s degree in Oriental Medicine from Dongguk University in Los Angeles, California. She also speaks Korean and Chinese. Haiyan worked in a variety of health care environments, including western and Chinese medical hospitals in China and private clinics. She served as a volunteer to the native American people in a Navajo reservation area under very crude conditions during her missionary trip . Also, she has skills in both Chinese and Korean styles of healing techniques. She has treated patients with a wide range of ailments, including a variety of pains, insomnia, anxiety, stress, vertigo, migraine, high blood pressure, stroke sequelae, asthma, cough, digestive disorder, menstrual disorder, infertility, shingles, diabetes, acne and many other complaints. Haiyan believes that acupuncture and Chinese herbal medicine are an approach which can help people to experience natural healing powers and achieve their optimum state of well-being. She is dedicated to serve communities with her knowledge and talent derived from ancient wisdom.